Questions can make or break a negotiation — and yet they’re undervalued and overlooked by most negotiators. Do we think about our questions ahead of time? Are they carefully crafted to produce useful answers? In my experience, most negotiators just wing it. They don’t understand the value of good questions, ask good questions, or know how to listen to the answers. As a result, they don’t accomplish what they can and should. Make most every business presentation and personal encounter go YOUR way. Click Here to ORDER The Power of NO for a special limited-time discount! Click Here to ORDER Jim Camp's The Power of NO for a special limited-time discount! Over 100,000 people have negotiated tens of BILLIONS of dollars using this system. The Power of NO now for a special limited-time discount! Yes! I want to fearlessly ask for what I want and easily get it in any negotiation using the power of NO! 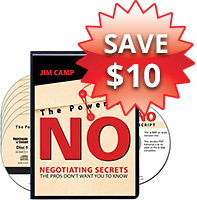 Please send me Jim Camp's's 6-CD audio program The Power of NO plus writable PDF Workbook today - for just $69.95, which is $10 OFF the regular program price.